Nowadays, “drug awareness” extends past the more commonly known addictive drugs, such as opiates, cocaine and LSD. Innocuous products, such as aerosols and spray paints can pose just as much a threat to a person’s well being as any one of the more dangerous addictive substances. 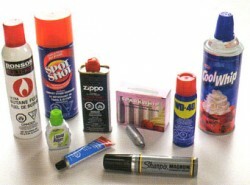 There are a wide variety of inhalants that are often abused. According to the National Institute on Drug Abuse, young people, in particular, have taken to inhalant abuse, mostly because these products appear in most everyone’s household. With an estimated 23.3 million Americans reporting having used inhalants on at least one occasion in their lifetimes, anyone concerned about a teen’s or loved one’s propensity towards inhalants may well have reason to be. As with any form of drug abuse, inhalant addiction can develop over time as the drug alters essential brain chemical pathways. The drug’s cumulative effects on brain and central nervous system form the basis for inhalant addiction to take hold. With each use, inhalants force brain cell sites to release large amounts of neurotransmitter chemicals, most notably dopamine chemicals. Dopamine plays a key role in regulating the brain’s reward system, which ultimately defines what drives or motivates a person from day to day. Signs of inhalant addiction can be difficult to spot as these drugs produce rapid effects that fade quickly. Since most inhalants take the form of everyday household products, left behind paraphernalia can be easy to miss. Each time a person uses inhalants, neurotransmitter chemicals flood the brain. When done on a repeated basis, chemical imbalances start to take shape. In the process, the brain cells releasing these chemicals undergo considerable strain, which causes damage to cell structures. These developments all feed into the eventual physical dependency that inhalant addiction breeds. Physical signs of inhalant addiction increase in severity and frequency the longer a person uses the drug. In effect, as brain cells deteriorate, they require larger “hits” or dosage levels in order to produce the desired “high” effects. This leads to further structural damage as well as a worsening of physical withdrawal effects. Ultimately, these interactions set a vicious cycle of drug abuse in motion. Behavioral signs of inhalant addiction become apparent as the drug’s effects start to interfere with the workings of the brain’s reward system. Repeated surges of dopamine chemicals eventually reconfigure how this reward system works. By the time inhalant addiction sets in, getting and using inhalants becomes a person’s sole motivation throughout any given day. At this point, he or she has come to depend on inhalant effects to cope with daily life. It’s not uncommon for inhalant addicts to develop psychological disorders as a result of the state of chemical imbalance in the brain. The presence of psychological disorders further aggravates signs of inhalant addiction, as the combination of mental illness and addiction tend to thrive inside the brain’s chemically imbalanced state. With the majority of inhalant products being everyday household products, distinguishing actual drug paraphernalia from normal items can be difficult. For this reason, it’s often easier to pay attention to the users overall appearance as signs of inhalant addiction tend to show up on the body in one form or another. Chronic drug use will inevitably leave an odor on the breath and/or clothing that lingers for hours. Discolorations on a person’s clothing from paint, glitter or odd stains may be indicators of inhalant abuse. Frequent inhalant use also irritates skin surfaces, so users may present with skin abrasions, rashes, burns or even swelling or inflammation. According to the National Center for Biotechnology Information, chronic inhalant abuse causes significant and oftentimes irreversible damage to the brain and central nervous system. Over time, inhalant effects start to breakdown the myelin sheathing that lines neuron cells. Inhalant toxins tend to concentrate inside neural tissue, which eventually causes tissue structures to atrophy to the point where lesions start to form. Ultimately, the effects of inhalant addiction can damage a person’s motor functions, cognitive functions as well as diminish sensory perceptions. With inhalant abuse, the risk of experiencing an overdose can happen at any given time. This means, first-time users as well as people who’ve used for months or years on end can develop signs of overdose. Another condition, known as “sudden sniffing death” occurs when inhalant effects trigger an irregular, rapid heart rhythm. This condition can bring on fatal heart failure within minutes as of the time a person starts inhaling. In cases of inhalant addiction, risk of experiencing sudden sniffing death is extremely high.